It's that time of the year when I wear a sweater every day of the week... cable knit, ribbed knit, bouclé, etc. 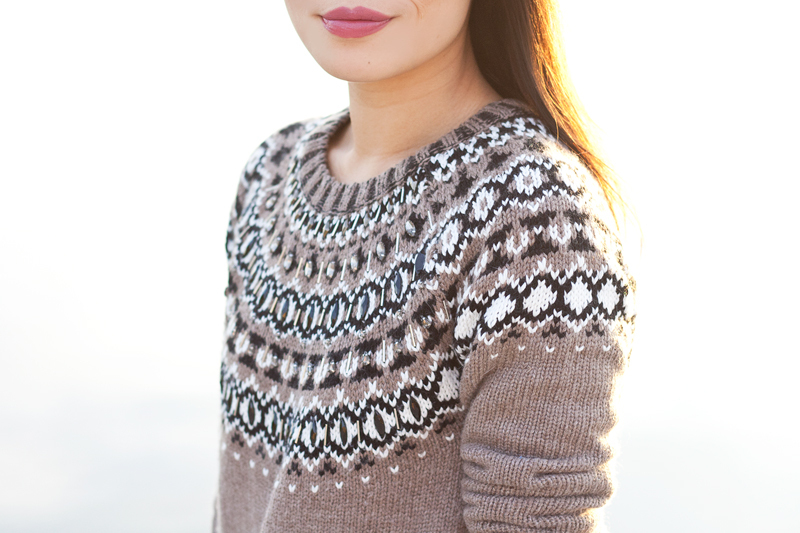 My current favorite, however, is fair isle. There is something quite cozy and extra magical about it. When I slip one on, I just imagine myself sitting by a fireplace in a cabin somewhere out in the snow sipping a cup of hot apple cider. Wow, I wish I were actually doing that right now. I absolutely adore this Puttin' On the Ritz Sweater by Bailey44. 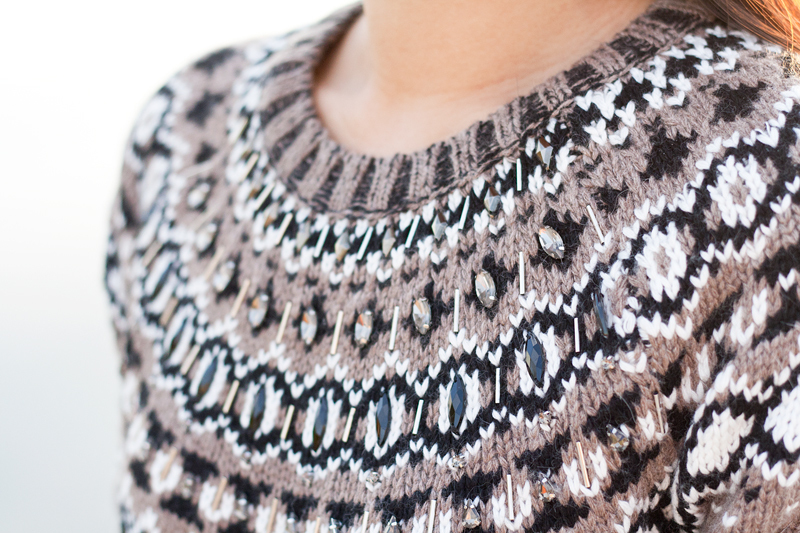 Not only is the fair isle pattern beautiful, it is also embellished by jewels, adding a touch of sparkle to this holiday season! I paired it with a gorgeous knit skirt (also by Bailey44), strappy buckled booties, and this extraordinary boxy shearling bag! How are you keeping cozy this holiday? Puttin' On the Ritz Sweater c/o Bailey44. Shubert Alley Skirt c/o Bailey44. Boxy shearling bag c/o Vasic. Haywire strappy leather booties c/o Seychelles. Pacific ring c/o Kris Nations. I just love that skirt its so cute!! I love the color scheme, and I like that you paired the outfit with black booties. I love mixing black and brown colors, even though it's considered a "fashion faux pas." The pleated skirt dresses the sweater up a lot, that and the color scheme make the outfit less Christmas-y and more versatile for everyday use. Definitely drawing some inspiration from this outfit!